Today, Pepsi® premieres its 2019 global football campaign under the brand’s new international platform and tagline, PEPSI, FOR THE LOVE OF IT. Encouraging people to go all in for the things they love, FOR THE LOVE OF IT is brought to life through the brand’s passion of football – which has been at the heart of Pepsi for decades. Across the brand’s trademark, this year’s campaign celebrates the brand’s ongoing partnership with the UEFA Champions League, with two of the world’s best footballers together for the first time, facing off in true entertaining Pepsi style. Featuring four-time UEFA Champions League winner, Leo Messi, and record-breaking forward and “Egyptian King,” Mohamed Salah, this year’s creative, “Last Can Standing,” sees the two iconic forwards engage in a playful duel of passion and entertaining technique for one of life’s favorite refreshments – a delicious Pepsi. As the pair pull up to a remote petrol station they discover there is only one can of Pepsi left in the fridge. What quickly unfolds is a series of action-packed trick shots and skillful challenges as they go head-to-head for the coveted cola. “It was a lot of fun to film this year’s commercial with Pepsi – it’s a concept with fun and football skills at the heart of it. I hope this year’s campaign continues to encourage football fans to embrace their passion and love of the game,” said Leo Messi. “I’m very happy to see the partnership with Pepsi turn global, and I’m excited for what lies ahead,” said Mohamed Salah. 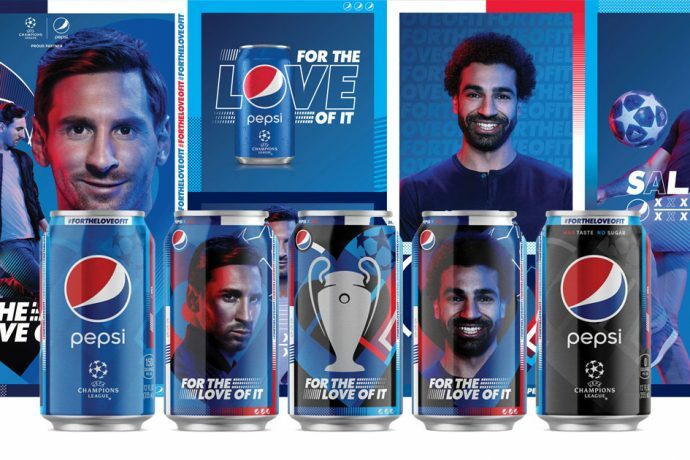 Beginning today through the lead-up to the UEFA Champions League Final in Madrid, 65 countries around the world will be rolling out this year’s suite of football creative, including exclusive content, as well as design-led packaging, out of home and in-store point of sale, across Pepsi and Pepsi Black / MAX. While filming the 2019 campaign, Pepsi captured some amazing behind-the-scenes moments with Messi and Salah. As expected, these athletes’ feet are never far from a ball and Pepsi kept the cameras rolling to capture their unmatched skills – both pitch and Pepsi-focused. The content will be shared exclusively on social channels. Pepsi is a proud sponsor of the UEFA Champions League.